One of the milestones of small children is mastering how to write their own name. At first it's quite a challenge getting to grips (literally) with the skills involved in penmanship with some letters proving extremely difficult for little hands. 1. Showing our son what his name looks like and labeling some of his items. Name recognition is one part of the puzzle. 2. Familiarizing your child with the alphabet and the letters involved in creating their names. 3. 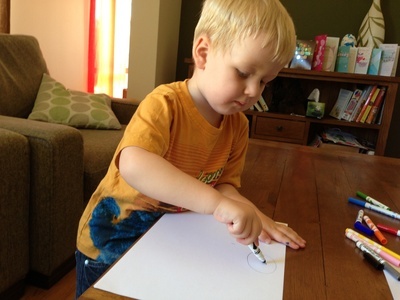 Before starting on actual letters we got our son comfortable with holding pens and pencils and getting him to draw simple lines and shapes. Not only does this help them master drawing with a pen but this also creates some terms of reference for when you are explaining how to draw certain letters e.g a H is three lines, an O is a circle, an X is two lines crossed etc. 4. We demonstrated to our son how to write his name and then took time showing him how to form each letter individually. 5. Finally, we have never pushed our son to practice or draw if he doesn't want to. At his early age learning still needs to be fun and it has to be something he wants to do. We figured that if he wasn't interested now, we'd just come back to it in a month or so and try again. What tips do you have for helping your child learn to write? Favourite shopping centre in Perth?